Rock music has a long history of concept albums, going back to the Beatles' Sgt. Peppers, and reaching its height with the art rock of the 1970s. Folk-oriented concept albums are much rarer. There have been anthologies of songs by a particular composer, and occasional albums of songs about particular topics by folk artists. But this week we have an interesting CD by a singer-songwriter who has created the closest thing to an old-fashioned concept album as you are likely to find in the genre. It's by Ellen Cherry, and it's called (New) Years. Ellen Cherry, apparently a stage name taken from a novel, is a Baltimore-based folkie who has been recording since 1997. She has released a series of independent albums since then, and has also created music that has been used on a number of TV shows. While many rock concept albums consist of a series of generally lyrically-related songs, Ellen Cherry created songs that are set in specific years from the Civil War to the present, written from a woman's point of view. They start out historical, but by the time of the ones set in the present and recent past, they seem autobiographical. The quality of the songs is very high, with a combination of good narrative and interesting emotional overtones in the lyrics, and the compositions are fairly sophisticated musically, not just typical three-chord folk style songs. Ms. Cherry is joined by a small group of sympathetic players who give the album a mostly acoustic folky sound, generally without the aid of drums. Ms. Cherry is a pleasing vocalist who has a great voice for bringing her songs to life. The instrumental arrangements on the CD can hint at the year about which the song revolves, though not always, and range from jazzy to a cappella to vaguely Victorian. She is joined on the CD by guitarist and backing vocalist Michael Prout, bassist and keyboard player Andrew MacCallum, plus some added supporting vocalists. They do their job with discretion and never get in the way of the music or try to call attention to themselves, while adding nice, subtle textures. The tracks are arranged chronologically on the CD, with the song set in the Civil War at the start, and ending with the song set in 2010, the year the CD was recorded. 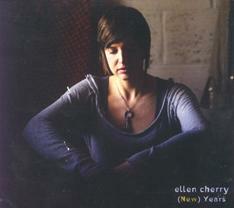 Ellen Cherry's new CD (New) Years, is an excellent release, and one of the relatively rare folk concept albums. It works well because of great writing, both lyrically and musically. And the chronological flow of the album from the Civil War to the present, moving from historical to personal, works especially well. The rather intimate, almost completely drum-less accompaniment is tasteful and the playing nicely understated, keeping the focus on Ms. Cherry's songs and appealing vocals. Our grade for sound quality is close to an "A." The mix is clean and warm. Ms. Cherry's vocals are well captured, and the dynamic range is not too bad, though it could always be improved though less volume compression. Singer-songwriters generally have something to say. In the days of art rock, when concept albums were popular, there was usually a similar attention to lyrical content and flow. So it's surprising that there have not been very many folk concept albums. Ellen Cherry's (New) Years nicely combines the two, and makes for fine listening.